Black Paradox is coming to console! Fasten your space seatbelts. Black Paradox is almost here! We know lots of you have been waiting for it, and finally our game is coming to console (30 April/1 May (PS4 NA/EU), 3 May (Switch/Xbox)) and is ready to leave Early Access in its Steam version (2 May). And there’s more. The game’s coming revamped with updated graphics, a new game mode that unlocks after finishing the main story and much more! Black Paradox is going big…. Big in Japan! We got featured as Game of the Day on the Japanese Apple Store! 乾杯! Yesterday Apple has featured Black Paradox on the Appstore as the Game of the day! Lots of players are enjoying Black Paradox and reviewrs are recommending it! Let’s keep on piling on those achievements! Touch Arcade game of the week: Black Paradox! Black Paradox available on the AppStore! @BlackParadox_FS is finally available on the AppStore! Get ready to play everywhere and save the galaxy on your apple devices! This week we’re bringing you 3 new enemy waves, a new weapon, some new cool art and solved a bug in the soundtrack. After we added the new track last week, a bug made only the first 2 tracks play… We fixed it now, so you can hear all the old and the new track now! 4 new waves are here to bring you down! A lot of them are laser focused and will be a real obstacle! Also we hadn’t added a new weapon in a while. So here’s a new one for you, the Moroder! Are you a videogame journalist, a Steam Curator, a Youtuber or a Twitcher and you want to make a review/video of Black Paradox? We have a Distribute() and a Keymailer account! So contact us there! This update expands the current gameplay with more variety in both the weapon and waves department and we hope it’ll increase the fun of the game! Last week we said we were working on a new mechanic. And as we tested it we really loved it! So we have a new feature, the combo system. Some powerups will create cool combos that will powerup the player further. We also have a new soundtrack added to the game! Soon we’ll update the soundtrack DLC too! Oh also a new powerup joined our ranks! The Lucky Dice gives the player a chance to come back to life with some health when dying. 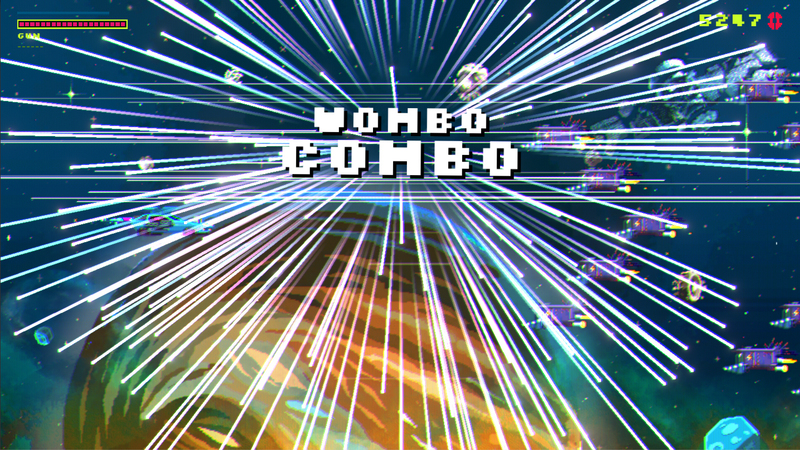 Also as for the combo system 5 combos will be available for now, but we plan to add more! Each one of them requires the player to collect 2 specific items, but we’ll keep which items a secret for now not to spoil the fun in finding them all. The Combo System adds a lot of possibilities for expanding the game! We want to add other combos to make less useful items more viable and to make the game way more interesting! Who said balance??? Oh wait I did! To balance off the game we’ve added 3 more scripted waves. Also we’ve worked a bit on the other waves to better integrate with the new ones. More work is needed, but were keeping it up! Oh also we’ve made the demo a bit more balanced too! So as I mentioned we have 3 new waves and a new powerup, the Advanced AI, a powerup that incerases your drones attack power! We’re also working on a restock function for the chip shop, though it’ll still take some time to have it in the game. A few items weren’t interacting correctly. We fixed the issues! How’d you like this new update? There’s new stuff as always, but also a lot of balance! But we have even more in store! See you next week! One big update coming right up! We wanted to focus on the balance again this week, but even though we worked on it too we ended up having other priorities. I’ll talk about them in a second. As I mentioned last week we were working on a new chip and now it’s here for you guys! The Vampiric chip! Want more? We also implemented the winner of the August design contest! 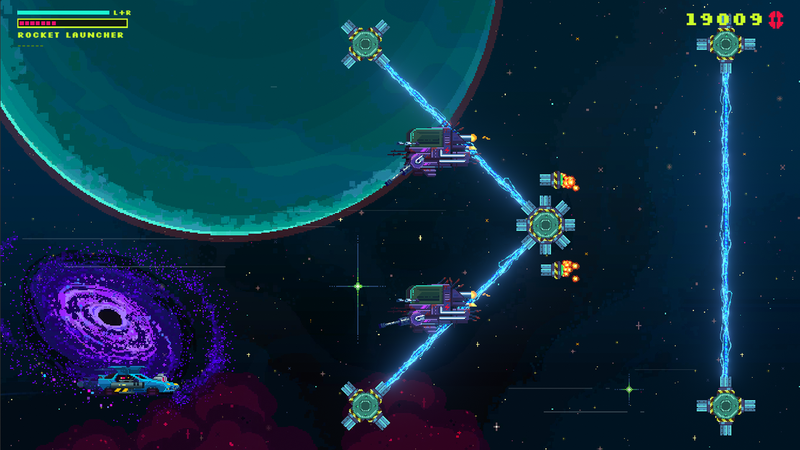 Asteroid Volley: your bullets will push asteroid away giving them high damage when hitting enemies. 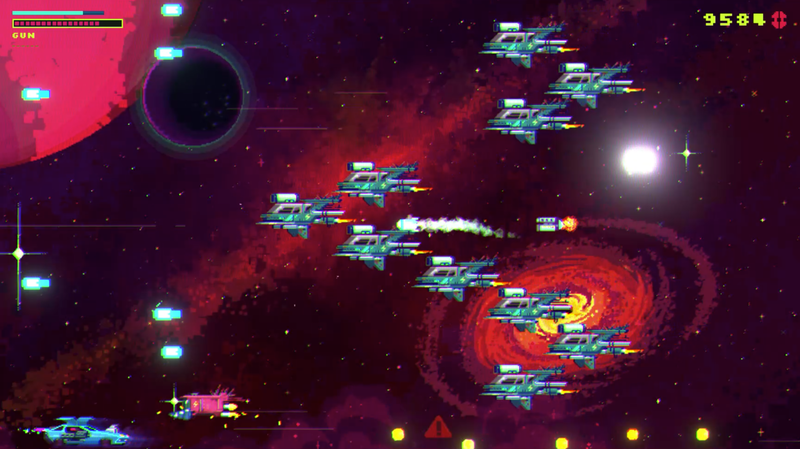 We love Black Paradox’s soundtrack, so we expanded it with 2 new tracks, a game and a boss one! We’ll add them to the Soundtrack DLC next week. Some bugs had sneaked past us, but our testers are always there for it! We fixed them in a jiff! Geyser damage lowered. Also the Geyser bullet used to cover the enemy bullets making it hard to dodge. Problem solved! The Charge Shot had a bug that made it useless. Not it works correctly! There’s a lot of juice here. Have fun exploring new builds with the new chip and save the galaxy! This week’s update was centered around balance, but we also have some extra content too! The game’s random generator should be more balanced and savage situation a bit rarer. Also new enemy waves have joined the fray and are gonna bring you hell!